That's a plate-less electrical outlet in some one's home believe it or not. Oh man, if it's possible to fall madly and deeply for an outlet, I think I just did. This is the 22 from Bocci and I've never seen anything like it. 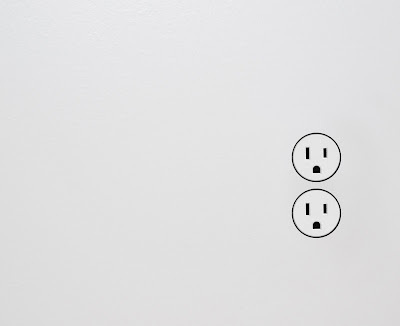 Bocci is a Canadian design company and this 22 outlet is part of a system that includes similar minimalist outlets for data, phone, cable and more. Check out Bocci's website. These outlets are actually plastered into the wall during construction and can be accessed later for service through the face of the outlet itself rather than by removing a plate as is usually the case. It may sound odd, but "what color outlet covers should we get?" is a refrain I hear regularly. Well, the fine folks at Bocci remove that question from the table completely and the result is absolutely beautiful. Creede Fitch has a design blog called Grassroots Modern and he's actually installing a series of 22s in his own home. You can see his progress here. Bravo Creede; I'm curious to see how he makes out with them. I found a video that discusses how this plate-less outlet system works and it's made a believer out of me.